Amazon.com added 9,400 employees to its payroll in the quarter ended March 31. That’s the biggest single quarter of headcount growth in Amazon’s history. The company now employs 65,600 full- and part-time workers worldwide. With its current trajectory, Amazon is rapidly approaching Microsoft in size. 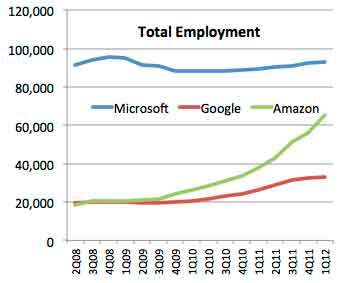 Microsoft employs more than 93,000 but hasn’t been growing as quickly as in the past. More than 40,000 of Microsoft’s employees are in the Seattle region; Amazon doesn’t break down its employment by region. In one of Seattle’s biggest real-estate deals in years, fast-growing Amazon.com has agreed to buy three blocks in Seattle’s Denny Triangle — and preliminary paperwork has been filed with the city to build a 1 million-square-foot office tower on each of them. The deal includes options for Amazon to buy even more of Denny Triangle holdings. 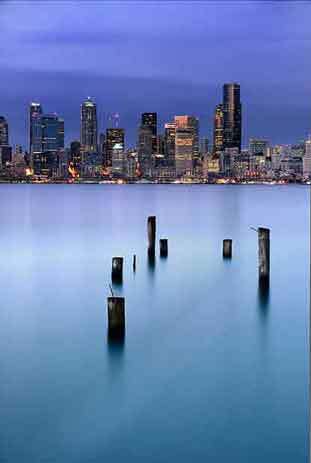 “In terms of economic development and new jobs for Seattle, this is off the charts,” Al Clise said. So, why is Amazon dominating the recession and post-recession? Though, it’s possible that Amazon is ramping up in another area, secretly, as they have been known to do. On another note, I tried to find perspective on the size of these companies. I found that, according to reports (pdf), the total size of the tech industry in United States is 4.15 million. Which is an all-time high for the industry bouncing back from 2008, the last time numbers were this good. I also found that Foxconn and it’s parent company employ 836,000 workers, third largest in the world, and IBM employs 427,000, tenth largest in the world.